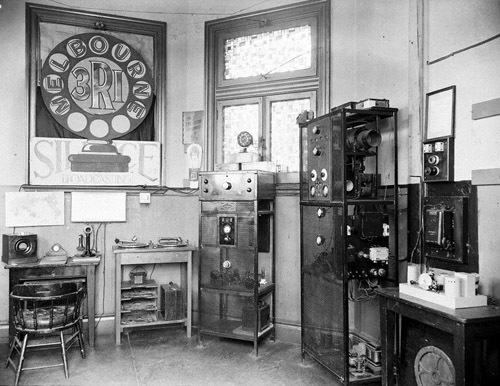 I initially thought that the photo of the Radio Room was taken in the early 1930s as it appears to be well set up with broadcasting equipment - including two turntables with electric pick-ups for playing the 78 rpm records which you can see stacked under the turntables and well made transmitting equipment. I don't believe that it is a photo of their very first transmitter because it looks more like a Mark II version with the rough edges "knocked off" from a first attempt! Amateur Radio magazine, of October 1933, reported on activities of the VRI Radio Club stating that the club was established in 1926 and since then (to Oct. 1933) has grown to approximately 300 members. Amateur Radio is the official journal of the Wireless Institute of Australia, its report included: “In the last six years nearly 5000 requests had been received from listeners for QSL Cards”. QSL Cards are a formal acknowledgement of a transmission, supplied on request by the transmitting station, only after receiving a satisfactory reception report. The first entry of 3RI in an Australian Call Sign Listing was in the 1928 supplement to the ‘Homecrafts’ 1927 Catalogue of Radio. 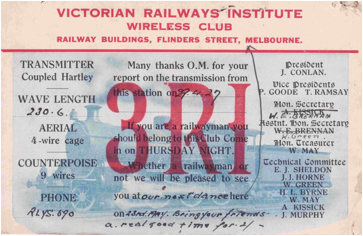 The club operated as 3RI on the broadcast band and later the Australian International Prefix of VK was added, hence VK3RI. (VK – Australia, 3 – Victoria, RI – Railways Institute) When amateurs were prohibited from transmitting on the broadcast band (amongst the ever growing number of commercial and ABC stations), the club continued to operate on the normal government allocated amateur bands. However its “musical entertainment” of necessity gave way to the allowable Morse code and speech transmissions permissible under the then “Experimental” and later “Amateur” licence conditions. There are a few 3RI/VK3RI QSL (Confirmation of transmission) cards at the WIA Archive. The above is the most interesting one and "ties together" the radio station and the dances at the VRI. The actual location of the Radio Room transmitter room is now known to have been in the octagonal room above the 3rd floor at the western end of the station. This room accessed from the ballroom ante-rooms and is actually on the 4th floor of the building. A door opens on to an area of flat roof which cannot be accessed from anywhere else. The club rooms were located in the building on the roof beside the cloak tower. Many other groups also used this room and the others in this particular roof building. I joined the Victorian Railways as a junior clerk in Feb 1959. I joined the stores branch and was assigned to the Overhead Maintenance Store which was in Batman Ave. As well as parts for overhead construction and maintenance, OMS also had a range of parts to service the railway fleet of road vehicles, which were serviced and maintained there. The Signals Branch also had an office and there and so we carried hundreds of items for them in our store. This area has changed dramatically in recent years. All of these office buildings and maintenance facilities were demolished to make way for the roofing of the Flinders Street yard. Because of all the work and maintenance going on in the area, there was also a First Aid room and the officer in charge was a keen photographer. As I also was keen on photography we soon became friends and he introduced me to the VRI Camera Club (formed in 1958). The Camera Club had its monthly meeting in the VRI council room (on the roof) with the radio room was on the right just as you got to the door. Quite often the radio guys would be there and we would drop in for a chat. You got to these rooms from a narrow stairway past the gym then onto the roofThe meeting often had up to 30 plus people looked at pictures, discussed camera equipment and listened to talks on photography. The Club also had a monthly photography competition. The topics for the year were listed either for slides or for B&W enlargements. This raised my interest in the processing and printing side of photography which led to the club asking the VRI for somewhere to set up a darkroom. They offered us a store room ‘up behind the ballroom’. This needs a little explaining. I’m sure many Melbournians will remember the ballroom. As well as the regular dances, it was also used for many other functions, dinners, presentations etc. The ballroom extended the full width of the building and was entered from the corridor along the south, railway side of the building. Across the western end was the kitchen. It was a hive of activity whenever a function was on. Up a very steep narrow wooden stairway in the kitchen was a little used storeroom. This was the circular little room (octagonal) with a small dome which is very easy to spot in any pictures. It somehow finished off the look of the building from that end, mirroring the big dome at Swanston Street. It was full of junk when we set up our darkroom. I would often go there after work, usually 5:30 – 6pm, sometimes on my own and sometimes with friends. After a few hours splashing around with the chemicals, printing and enlarging photos, we would then descend the narrow stairs to try and exit the building. There was a small landing halfway up the stairs with a door access to the balcony used by the bands and, because no one knew we were there, we often had to clamber over the instrument cases piled up there. Getting in was not a problem - getting out sometimes presented a real challenge. If the function was a dance, it was not so much of an issue. With the lights down and the coloured spots on the mirror ball turning in the middle, we would simply weave our way through the dancers, say hi to the bouncers on the door and make our way to the lift before they had a chance to ask who the heck we were and where we had come from. If there was a dinner that created a problem, especially if there were speeches! Sometimes we had to hang around in the kitchen for 10-15 minutes before we made our dash for it when the drink waiters headed out to do their rounds. As we weren’t in suits, we looked right out of place but the only way out was right through the middle of whatever functions were happening. The easiest escape was when it was hot. On summer nights at a dance, the ballroom was so poorly ventilated that the fire escape doors on the south side would be opened to let a bit of air through. These stairs went right down the outside of the building (with a landing at each floor) and finished up on platform 1. I could see straight away if there was a Box Hill train in platform 2 and I would be on my way home in no time. I used the temporary darkroom for about two years until I was able to transfer to the VR Photographic Dept which was in room 159 at the Spencer Street Head Office. The department at that time had a staff of 12 and was under the direction of the Printing Manager, Mr Mal McKenzie. Although his main role was at the printing works in North Melbourne, he visited regularly and I got to know him quite well. A year or so later I became the VR Publicity Photographer assigned to the Public Relations and Betterment Board which was part of the Secretaries Branch. I worked in the same office as Kevin Findlay for 3 years, ‘68-‘70 and we quite often went on assignments together. I used to go to film nights he held in his home in Glen Waverley for other railway friends and railway historians including John Buckland, Andy Lyle and the Puffing Billy Society which was just getting established at the time. Mal McKenzie was given the extra role of President of the VRI. The job took me back to the ballroom where I had to photograph him making speeches or presentations to different VRI groups. The Commissioners also often hosted dinners for groups of engineers or visitors, so I got to know the building, particularly the ballroom, very well. The Victorian Division of the Australian Railway Historical Society was formed in 1945 and its early meetings were held in one of four small rooms located in a kind of mini-penthouse protruding from the roof of the building. The VRI let these rooms to some of Melbourne’s smaller groups for their meetings at modest rentals. To access these rooms (which I recall bore the numbers 8, 9, 10 and 11) it was necessary to take the lift to the third floor and climb some very narrow stairs. A list of the various organizations and their assigned room numbers for the night was displayed in the lift, which must have been one of the slowest in Melbourne. We were always amused at the name of one these groups: The Melbourne Roller Canary Society. In the early days there were a number of rail fan groups that used to hire rooms at the station for their various meetings. During one such meeting; on this occasion the meeting of the Association of Rail Enthusiasts (ARE), there was an accident involving a tram that failed to stop as it came down Elizabeth Street. In the minutes of that meeting, in the general business section, was the note “Meeting adjourned for 20 minutes due to a tram colliding with the building”. No doubt such time was allowed for them all to go down and have a look! Note: The ARE was established in 1961 to cater for all those who are interested in railways and tram ways. There are almost 1200 members predominantly in Victoria, with others coming from all states of Australia as well as several other countries around the world. The Association operates a retail shop called "The Railfan Shop" which was located at 40 Market Street (Corner Flinders Lane) Melbourne until early in 2012. The Railfan Shop is now located at 4 Churchill St, Mont Albert. As well as our own productions, a large range of railway memorabilia, models, magazines, books and other items are sold. In addition, we also stock some books on ships and aircraft. Members of the Association attract a 10% discount on books purchased from the shop, which offers a mail order service to all members. Fritz Ziegeler was awarded the contract for the Elizabeth Street Clock on 22 March 1909. Ten pounds was forwarded as a ‘Preliminary Deposit’. The clock on the oblique face at the corner of Swanson and Flinders Streets is also a Ziegeler clock. 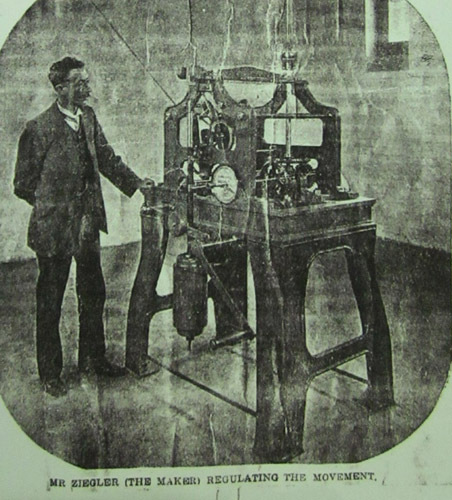 Melbourne clockmaker, Johann Frederick Wilhelm Ziegeler, was born in 1855 in Hanover, Germany. The Ziegeler family is included in the German Pioneer Settlers of Australia. Three of Fritz’s sons became apprentices to their father. Ron Ziegeler, Fritz’s grandson, had a clock left in his father’s (also Fritz) Will which was the very last clock his father had made. Ron had worked with his dad as a lad and studied at the Working Mans’ University. Ron, who became a radiologist, has since passed away. Ron’s cousin, John Webb, still holds many of the family records. John is the son of Ron’s sister, Doreen Ziegeler, now also deceased. Many of Ziegeler’s clocks were made under license to Gaunt. The family has tried for over three decades to have a plaque affixed to the Gog and Magog clock in Royal Arcade acknowledging the clock as the work of Fritz Ziegeler in 1892. To date this has not been realized. The original paint colour of the rendered concrete of the station building shows up in photos of the 60s as a very light cream. In fact it could have actually been white as the paints of the day were made from pigments, including lead and were hand mixed. The lead in the white paint tended to discolour slightly over time. The colour scheme was very close to the colours of the City Baths. The pending Royal Visit to Melbourne by Princess Elizabeth in 1953 initiated the repainting of the exterior of the station building. 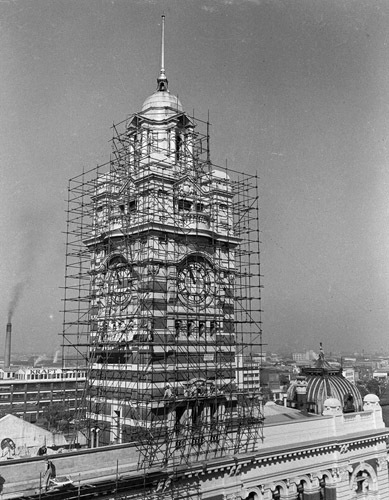 The clock tower was about half done when the Princess was called back to England, having arrived in South Africa, because of the critical illness of her father King George V1. The repainting of the station was consequently suspended. Following the Queen’s Coronation in October of 1953 and the announcement of the Royal Tour of the Commonwealth Countries to be undertaken in 1954, the Victorian Railways hastily re-commenced the painting job. Dad’s name was Robert Leslie Robertson (what was his mother thinking?) and for a while he called himself ‘Leslie’ but his friends and my mother always called him ‘Carl’. I also only knew him as Carl. He was an acrobat and regularly attended the gymnasium though he was not a railwayman by profession but a French Polisher. Dad was an honorary instructor at the gym and held Australian weight-lifting, wrestling and diving titles. I am so proud of my dad in the picture on p 108 of your book. He looks a bit younger than the others. I recognize his old mate, Les Wall, in the picture too. I grew up knowing his family and some of the others. 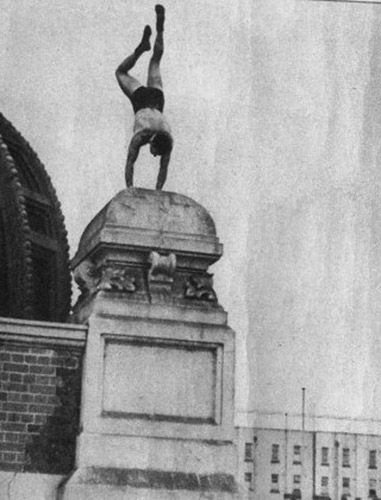 The PIX Magazine of 31 August, 1940, shows some photos of dad balancing on his hands on various bits of the station roofs and cupolas and doing hand stands on the parapet. The caption reads: “Rejected by Air Force - Sense of Balance Barred Him!” He was in fact profoundly deaf in one ear and had only 20% hearing in the other as a result of childhood meningitis but there was obviously nothing wrong with his balance! He married rather late at age 37 and mum insisted that he stop doing all these tricks on buildings because he now had a daughter to look after so I never actually saw him do these stunts. The station building had accommodation for the caretaker and his family on the roof. 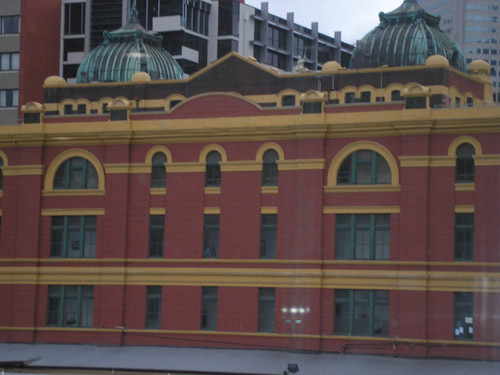 The building sits behind the parapet above the Degraves Street entrance and cannot be seen from the Flinders Street side but is clearly visible from the platforms. The first caretaker appointed in 1910 was Mr Abraham J Gallagher who held this position until 1919. It would seem that his primary responsibilities were connected to the VRI facilities. It is not certain at this stage when the employment of an in-house caretaker ceased. Users of the VRI facilities on the 3rd Floor can remember the jangling of keys and the appearance of the caretaker when it was time for their event to wind up. On the revised plans of 1930, a caretaker’s office was created on the ground floor at the 223 Flinders Street Entrance. The office has been modified a little over the years and the role of ‘caretaker’ has been redefined as that of building security. The building on the roof is still used by a transport related operation and has been reasonably maintained over the years to comply with current OH&S requirements.